The bubbly was gone, though the clubhouse carpet retained a spongy feel. The playoff-clinching party had been completed, and there was little to play for last night. Just a night off for a few players, a welcome back for J.D. Drew, and the slimmest hope in the battle for the American League East title. But given that a nearly impossible scenario was necessary, the real reason the Red Sox played last night was because they had to. That was why Chris Carter started in left field, and Jason Bay was given the night off, along with Coco Crisp and Jed Lowrie. That was why Mike Timlin was the first pitcher out of the bullpen in a tie game. Health matters, of course (which was why it was important to see Drew for four innings, his first appearance since Aug. 17), but with the Rays controlling the Sox' destiny in the division, there was simply little they could do. Even a 5-4 win over Cleveland, the tiebreaking run coming in the eighth inning, barely made a dent, other than making the night worth it for a chilly crowd of 37,719. "We're still trying to play and win the division," Dustin Pedroia said. "I know we're going to need some help, but guys are still going to come out and play hard. "The Rays won't lose. It could happen sooner than we expect it." Like tonight. As Pedroia was speaking, on the clubhouse TV the Rays were completing a comeback over the Orioles for a fourth straight win, which left Tampa Bay's magic number to clinch the division at 1. In other words, it might be time to book those tickets to Anaheim, Calif. The only thing that seems to matter now is how the Sox match up against the Angels. But last night's opponents were the Indians, and the Sox managed to win even though starter Paul Byrd lasted just five innings and four bullpen arms unavailable. "Regardless of who's out there, you still want to play the game right," said manager Terry Francona. "You want to win, but you want to do things that put your club in the best position health-wise and things like that." The Sox and Indians entered the bottom of the eighth inning tied at 4. But with one out, Jeff Bailey stepped to the plate, ripped a ball high off the Wall, and almost placed himself on a blooper reel on his way to his first career triple. "I put my head down and started running," Bailey said. "When I came around first, I picked up Grady [Sizemore], and I saw him back off the fence, so I knew it was going to hit the Wall. As I was rounding second, I actually almost fell down because I was watching the ball too long." "No," he said. "But up here you seem to run a little bit faster than you do down there." Bailey was driven home by Mark Kotsay's double down the right-field line. And that, too, was good for the Sox to see. It gave Kotsay two hits on the night, after he had just three in his last 34 at-bats. But this one looked like it was going to be much easier. It took until the 51st pitch, on which Jacoby Ellsbury struck out swinging, for Indians starter Fausto Carmona to get his third out of the first inning (and, as it turned out, his last out of the game). In those 51 pitches, the Sox opened up a 4-0 lead, consecutive doubles by Pedroia and David Ortiz leading to three straight two-out hits and a hit by pitch of Alex Cora. Ten men came to the plate, and the Sox ended the inning like they started it: with Ellsbury making an out. Byrd, meanwhile, couldn't contain his former team, giving up 11 hits, and runs in the second, third (two), and fourth. He threw 89 pitches and left the game frustrated. It wasn't his best, but not nearly as bad as Carmona's outing. "I let them back in it and the game needed to be over," said Byrd, who would appear to be in competition with Tim Wakefield for the fourth starter spot in the postseason. After an impressive stretch in which he went 8-1 with a 2.61 ERA, Byrd has been less effective. Over his last three starts, one loss and two no-decisions, he has a 6.75 ERA. It likely wasn't the way he wanted to enter the playoffs. As for Drew, he made it out of last night's game ready to tackle another one. 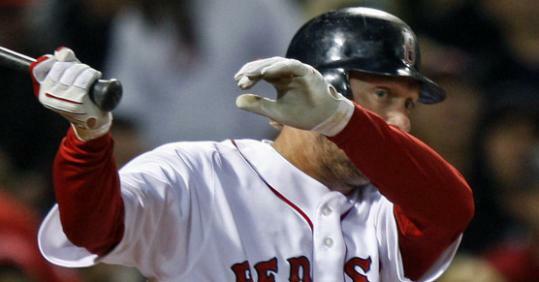 As did Pedroia, though he smacked his nose on the infield dirt making a diving stop in the eighth. He also notched his 54th double and 20th stolen base of the season. There are four games remaining, and although the Sox will play to win, victory, at this point, is not a necessity. "I don't think it matters," Francona said. "I hope we win every game the rest of the way out, because it's a lot more fun to win. Wherever we are Wednesday or Thursday, it really won't matter."